Arriving as soon as Q3 of this year, BlueStacks will work with any x86 desktop, notebook, or tablet running Microsoft Windows. The last bit there is interesting, as on their website BlueStacks claims the ViewSonic ViewPad 10 pro (a Windows 7/Android device coming soon) will be powered by their technology. BlueStacks business model is much like Swype's -- they aim to be bundled by OEM into new products rather than sell their software stand-alone. Android emulation on Windows is nothing new. We're even seeing it from RIM on the Playbook. If BlueStacks can pull it off as seamless and lag-free as they claim, that will be the real trick. We've signed up to get on their initial list of testers, and until then the jury is still out. In the meantime, their full press release is after the break. SAN FRANCISCO--(BUSINESS WIRE)--BlueStacks emerged from stealth mode today to announce it has secured $7.6M in Series A financing from Ignition Ventures, Radar Partners, Helion Ventures, Redpoint Ventures and Andreessen Horowitz to further the development of its groundbreaking technology that will allow users to seamlessly run Android and Windows applications on their x86-based devices. 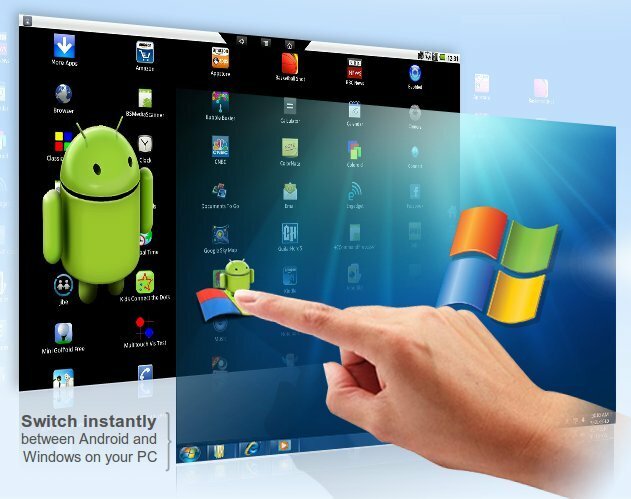 The simultaneous use of Android applications on Windows combined with multi-touch enablement provides users with the opportunity to quickly access personal and work applications, while giving PC manufacturers the chance to take advantage of the growing consumer demand for Android-based mobile enterprise applications. "It’s a compelling strategy for BlueStacks to enable all the popular Android apps on Windows devices. For consumers and businesses alike, this means getting the best of both worlds with the ability to run Android apps on a Windows device that offers all the advantages of familiarity, device interoperability and security," said Chris Cloran, corporate vice president and general manager of Client Computing Solutions, AMD (NYSE: AMD). "AMD is committed to collaborating with software innovators like BlueStacks who take advantage of our unique Accelerated Processing Unit (APU) technology to deliver seamless computing experiences across common industry platforms and based on industry standards." BlueStacks enables Android applications to run on Windows machines. The application can appear either as an icon on the Windows desktop, or within a full Android environment. BlueStacks technology can be integrated into offerings for both the consumer and commercial (enterprise) market segments. Incorporated in March 2008 by leaders in Microsoft Windows, mobility and Android development, BlueStacks is privately held and headquartered in Silicon Valley with global offices in India and Japan. For more information, visitwww.bluestacks.com.